Dynamic IP support means that your node can run on a dedicated server at home or even your computer, without the need to have a static IP. This is an important intermediary step before releasing a full-node-app for Mac/Windows and Linux. Soon, you will be able to fire up a full node on your computer with just a click, run it in the background and use it for your wallet. = full-node-app is coming to your PC/Mac soon! Through better IRI integration, Nelson memorises the last 10 connections from the same node and it’s quality (new and invalid transactions). This allows us to drop nodes that do not send any new transactions in a given period of time. If this situation repeats itself several times, the neighbour’s trust is penalised, making him harder to connect in the future, until the situation changes. A bad neighbour must not necessarily be evil. It can be a node running old IRI version and sending lots of invalid transactions. 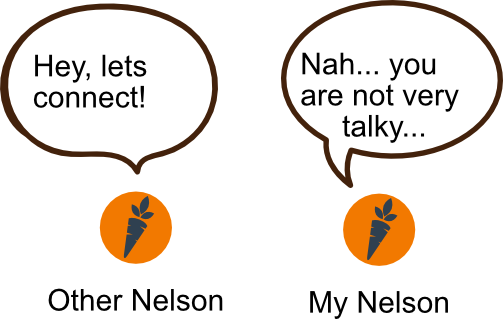 Either way, Nelson detects such neighbours now and penalises their trust for the upcoming connections. = better network quality and even better security! Webhooks will allow Nelson to transmit all the data about it’s status, IRI, connections and statistics to trusted 3rd-party services, without opening its own API to the world. This improves on security while allowing new services to emerge. I can imagine a service similar to http://tangle.glumb.de/ that shows a live graph of all inter-connected Nelson nodes. Monitoring services for multi-node operators is another use case. = Monitoring without compromising on security/privacy! There are few other new things like node names and IRI data within Nelson API. You can read more about this features in the Changelog on GitHub. 2018 will be an exciting year. Crazy plans ahead. Stay tuned!